Chasing Davies: Summer Must Haves for Under $40! 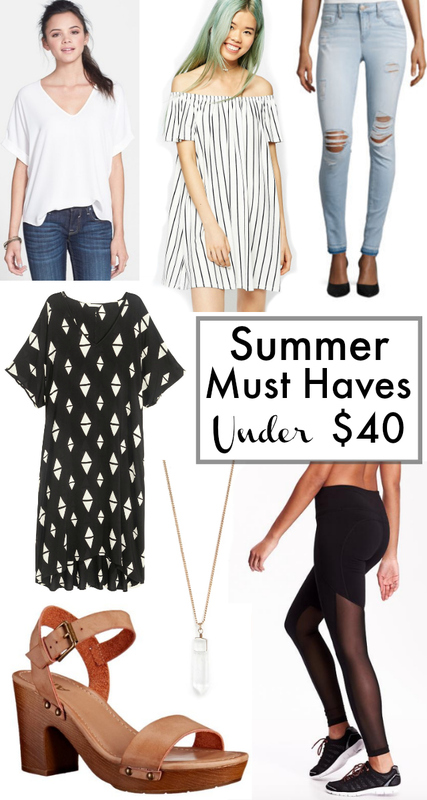 Summer Must Haves for Under $40! I love updating my wardrobe for summer with new trends or fresh pieces. It seems like every summer, my style shifts a bit. This year, I'm craving simple, easy and comfortable. But I'm also all about dabbling a bit in the off shoulder and clog trend. Before I totally commit to trends, I like to test them out with more inexpensive pieces - I can always upgrade later if the cost per wear is actually going to be worth it! Today I'm sure lots of great summer pieces all under $40! Perfect white top is only $20!! Love the loose cut and the draped sleeves! This off the shoulder stripe dress is so on trend, but you don't have to spend a lot - only $36! Summer denim under $30! The light, but not too light color and destruction is perfection. Easy, breezy patterned dress for summer (great for work or casual!) for under $20! I have this, love it. I'm obsessed with long crystal necklaces - and this one is under $6, but some of my favs are on Etsy for under $30! Boho, clog inspired sandal for under $35! Just ordered this pair myself! The perfect summer workout or athleisure leggings under $20 - the back mesh keeps you cool! Do you have any must have pieces that didn't cost that much? I'd LOVE to know!